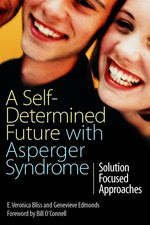 A book with the title A Self-Determined Future with Asperger Syndrome was brought under my attention today and it seemed like an interesting thing to mention here (although this is not a therapy site). The book is about a solution-focused approach to helping people with Asperger syndrome. This book illustrates how broadly the solution-focused approach is applied these days. The application of using it with Asperger syndrome is interesting. As the product description says: "The authors highlight how treating AS as a 'problem' is unproductive, and advocate a solution focused approach which recognizes and uses the strengths of people with AS to foster mutual respect and understanding." Often, just the way we look at realities determines whether we view them as problems or not. Surely, people diagnosed can have difficulties with social situations and change. At the same time, they can also be exceptional in their cognitive styles and achievements. So, what do we do? View AS a disorder and 'treat' them or focus on helping them develop a situational arrangement that works for them? How many other differences in who we are as individuals are treated as problems and disorders, rather than gifts and strengths? If someone prefers their own company are they a "social phobic" that needs fixing or a deep thinker, spiritualist, and meditator? Each of us has unique strengths that we can focus on an use that give us our own happiness not what some text books decides we need to be happy.